It was a classic “only in New York” moment. I boarded the M4 bus at 34th and Madison with the intention of quietly (if not quickly) making my way uptown after work. An older woman in a street-length fur coat and hat was waiting at the stop with her dog in a stroller. While I love animals, I have a hard time with dogs in strollers. Something about this just isn’t right. Dogs are meant to run free, or at least walk with a lease through the streets of Manhattan. To top it off, said dog was wearing pajamas. 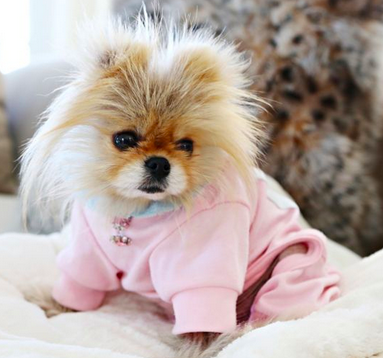 Full-on pink dog pajamas. What was interesting about fur coat clad woman and pajama dog was not just the whole stroller dynamic but the fact that once the two boarded the bus, our fur clad friend refused to break down her stroller. She kept is stationary, in the middle of the bus aisle and took her seat. Now, being a mother of 3 who takes the bus often, I am the queen of the stroller breakdown. It’s not easy. In fact it really stinks, but it is a necessity when you are riding a bus. You can’t block the aisle or other passengers with your open stroller. While some rolled their eyes and others huffed, noone confronted the woman until the bus started getting packed. Not only could no one get past the stroller, people couldn’t get on the bus. The bus driver began announcing that she must break down the stroller. Fellow passengers offered to help her. But she just yelled out “He doesn’t want to get out!” at everyone. Essentially, the pajama-clad dog would not be moved. Once this statement was made, I couldn’t help but eyeball the dog. Dressed in cozy pink pjs and lounging in a blanket fluffed stroller, I guess I wouldn’t want to be moved either. Isn’t that just the thing about pajamas? It’s like, they just don’t require you to do much more than be comfortable. No unnecessary buttons, no tight waistbands. Nope. Just comfort. So on some levels, while everyone was exercising the anger reserved especially for those who mess up their EOD commutes home, I secretly understood this dog in a stroller. As someone who works in PJS, how could I not?